Place the blueberries in a non- metal container and cover with the Cider vinegar. Place in the refrigerater and let marinate for about 3 days or longer. Pour the marinated blueberries and vinegar into a blender or Vita mix. Puree, then pour through a strainer into a saucepan. Discard any solids that are left. Add sugar (if desired) and bring to a boil. Boil for 3 minutes to dissolve all the sugar. Pour the blueberry mixture into a container and chill until ready to use. Stir or shake the blueberry mixture well. Add 1/4 cup of the blueberry mixture to a tall glass. Add ice and about 1 cup chilled water or sparkling water. 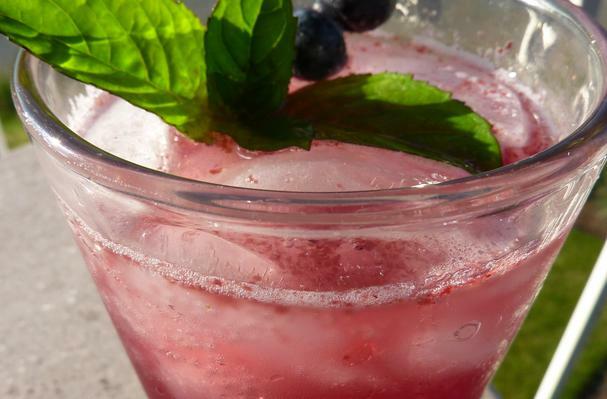 Garnish with fresh blueberries and mint if desired. You can use any berry in place of the blueberries, and while I am showing the sugar the recipe calls for- use discretion and feel free to add less or none at all!